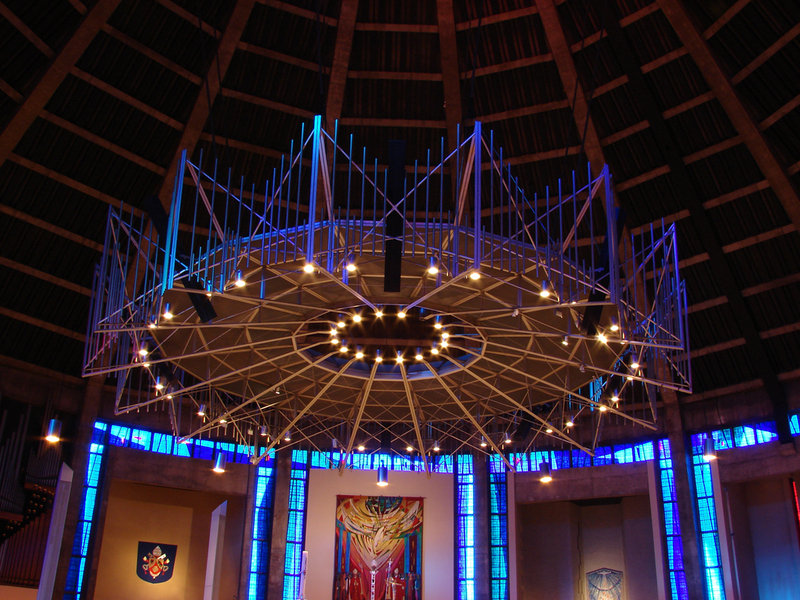 Liverpool Metropolitan Cathedral of Christ the King (usually shortened to Liverpool Metropolitan Cathedral) is a Roman Catholic cathedral in Liverpool, England. It replaced the Pro-Cathedral of St. Nicholas, Copperas Hill. The cathedral is the seat of the Archbishop of Liverpool, the mother church of Liverpool's Catholics, and the metropolitan church of the ecclesiastical Northern Province. In 1853 Bishop Goss awarded the commission for the building of a new Roman Catholic cathedral to Edward Welby Pugin (1833-1875), the son of Augustus Welby Pugin the joint architect of the Houses of Parliament and champion of the Gothic Revival. 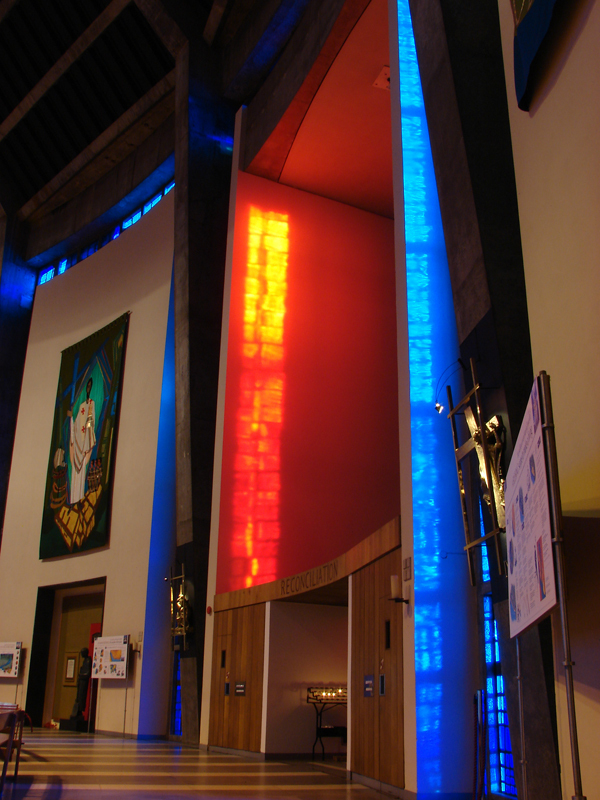 By 1856 the Lady Chapel of the new cathedral had been completed on a site adjacent to the Catholic Institute on Saint Domingo Road, Everton. Due to financial restrictions work on the building ceased at this point and the Lady Chapel now named Our Lady Immaculate served as parish church to the local Catholic population until its demolition in the 1980s. Following purchase of the present 9-acre site at Brownlow Hill in 1930 Sir Edwin Lutyens (1869-1944) was commissioned to provide a design which would be an appropriate response to the Gilbert Scott-designed Neo-gothic Anglican cathedral then emerging at the other end of Hope Street. Lutyens' design would have created a massive classical/Byzantine structure that would have become the second-largest church in the world. It would have had the world's largest dome, being 510 feet compared to the 450 feet on St. Peter's Basilica in Rome. The foundation stone for the new building was laid on 5 June 1933, but again financial restrictions caused the abandonment of this plan after construction of the crypt. 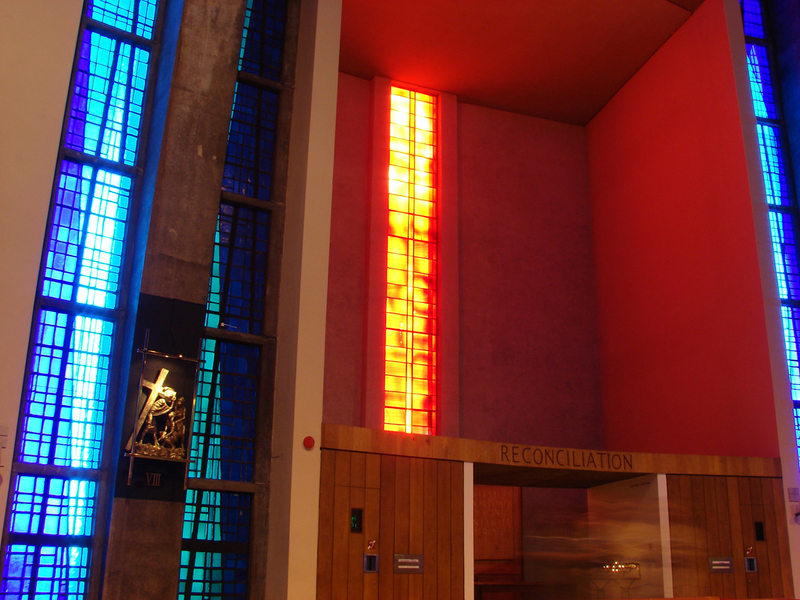 The new cathedral, designed by Sir Frederick Gibberd and consecrated in 1967, was built on land adjacent to the crypt. 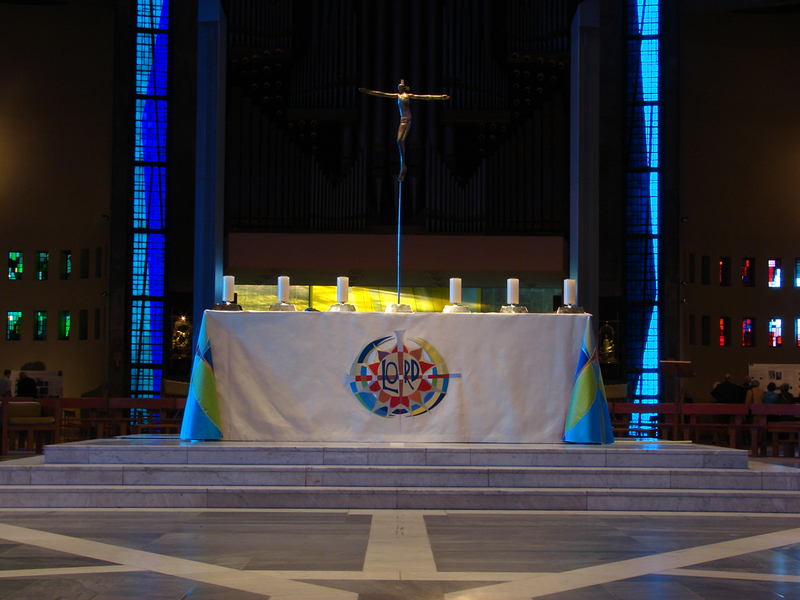 Its circular plan was conceived as a response to the Second Vatican Council's requirements for a greater participation of the lay faithful in the sacred liturgy. 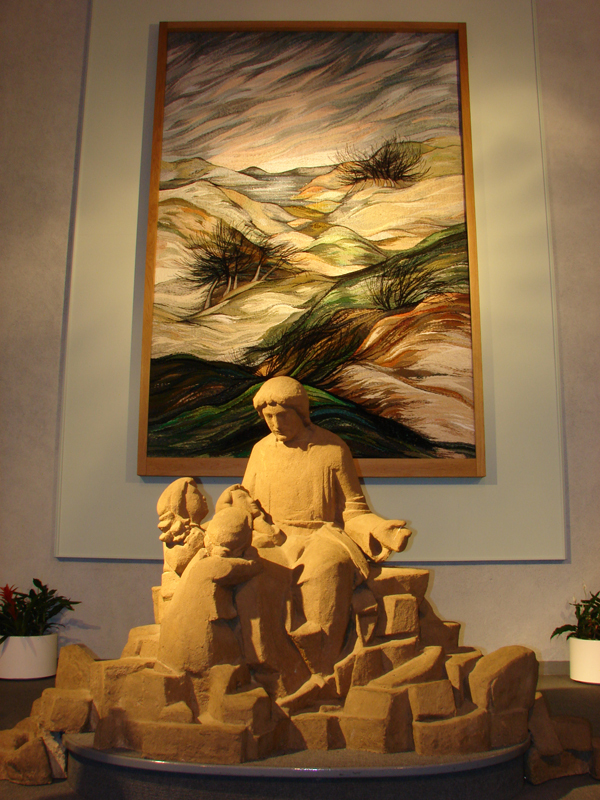 Whether or not the intimate integration of congregation and clergy that is effected by this design is the proper fulfilment of that council's call is a topic that enjoys lively debate throughout the Catholic Church today. Chapels are built in between the buttresses that support the tent-shaped spire (which represents the crown of thorns of Jesus) like tent poles. 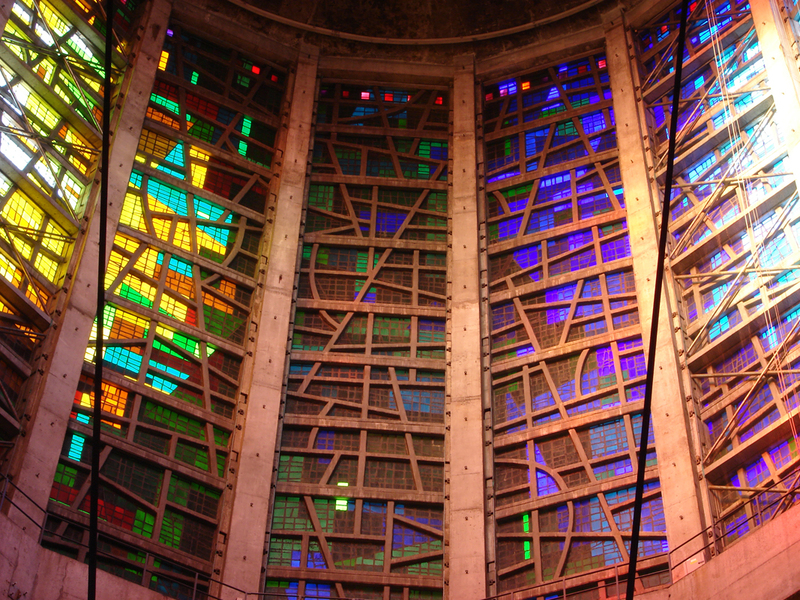 A short film, Crown of Glass, documents the construction of the cathedral's rainbow-coloured stained glass windows. Liverpudlians affectionately call the cathedral "Paddy's Wigwam" because of its largely Irish Catholic congregation and its general resemblance to a Native American teepee. The church's concrete exterior has not worn well and suffers from leaks. A belfry stands to the east of the church. A new stepped approach has recently been built as part of a multi-million pound restoration. The Cathedral's choir has a reputation as one of the finest in the UK. It has a very large repertoire, from contemporary music to Gregorian Chant. The Cathedral's crypt hosts the Liverpool Beer Festival each February. The bells at the RC Cathedral - Source LCC. The heaviest bell is to weight in at 92cwt (4 1/2 ton) where as Liverpool Cathedral's heaviest ringable bell is 82cwt! Last edited by theninesisters; 04-26-2007 at 06:25 PM. A couple of pics at the new Liverpool Museum which feature a section on the Metropolitan Cathedral being born out of the abandon Lutyens scheme. 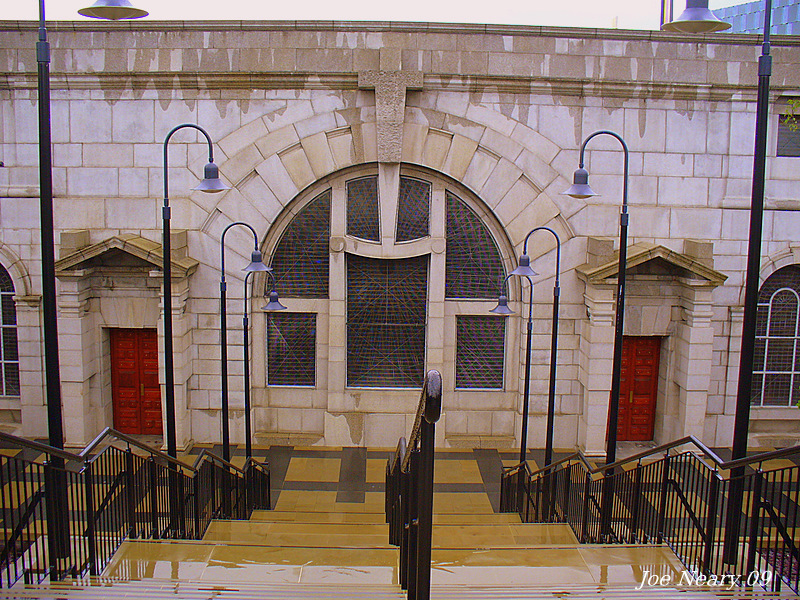 It was opened in 1967 on the feast of Pentecost. This is the opening procession. Then there is this fantastic photo which i'm sure any of us would have been proud to take. Great pic of the model and its actual comparison Joe. It gives you some perspective of how large it would have been. Ged, do you think anyone would have wanted to see such a gargantuan building? grekko, I mentioned on the Museum thread that looking at the skyline had it been built, it looks toooo large. Maybe, but the one class of building that is supposed to be large is a cathederal. Fantastic building the Met Cathedral even if it they do call it a wigwam. 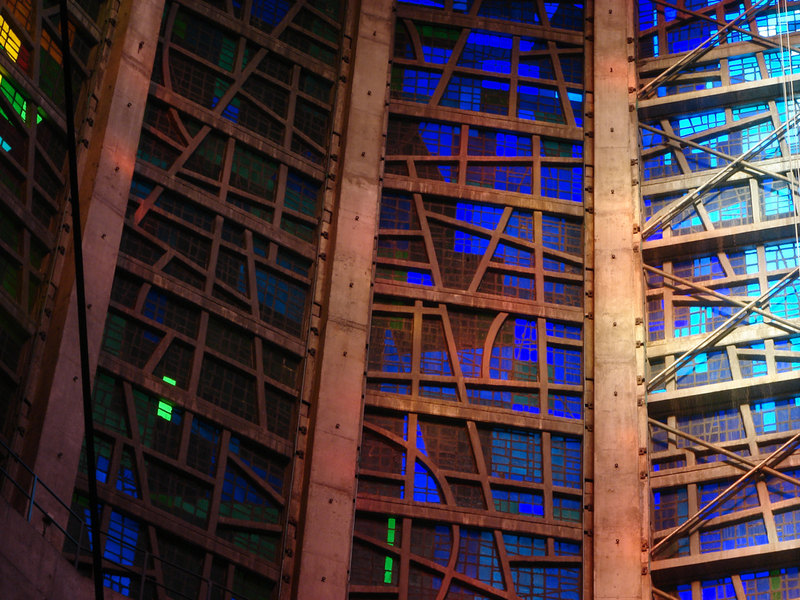 The play of colours through the stained glass windows is absolutely amazing. It has to be unique, just look at the play of light in the first post pictures. Click and drag with your mouse to move around the image. To zoom in, hold down shift, and to zoom out hold control. Right click for full screen and escape to return to home page.